This is a palm-sized printer used to print measurement data from the digimatic gage or to perform statistical analysis. This printer offers excellent functionality. You can use it not only to print measurement data, perform a variety of statistical analyses, and draw a histogram or D chart but also to perform complicated operations for X-R control chart. Equipped with RS-232C output and GO/NG judment output as standard functions, this processor ensures high reliability as an advanced quality inspection machine. 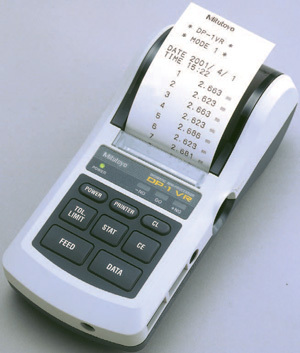 The line thermal printer enables fast and quiet printing.